The Drive Footstool with Handrail ships fully assembled. 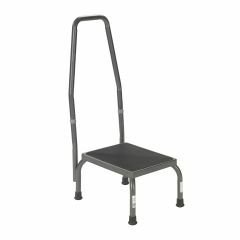 The steel-welded silver vein construction on this foot stool by Drive Medical is durable and attractive. The non-skid, ribbed rubber platform provides stability, as do reinforced rubber tips on the legs. Available with or without hand rail. Sturdy. Safe. Good Value. Durable. Strong sturdy . Use to get into bed. Lightweight. Good Value. Easy Storage. Durable. This is being used to allow person to sleep in a high bed. When she tried to get on the stool by using the handle it overturned on her causing her to fall. We turned the stool around and this seems to do the job. I still stay with her as it tends to rock as she uses it. Safe. Sturdy. Good Value. Easy Storage. High Quality. Durable. Solidly built; quickly delivered; as handy in the kitchen as I expected. Great product, and the handle is very important to it's use. Don't buy one without the handle or rated at less than 300 pounds. This makes it much, much easier to get into bed! How high is this step from the floor. Elderly woman can not step to high.